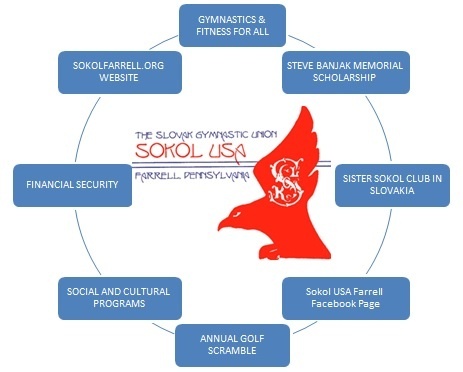 Sokol is a NON PROFIT FRATERNAL ORGANIZATION and therefore offers much more than simply a “for profit” gymnastic club. SOKOL FARRELL is an affiliate of Sokol of the United States of America, a division of GBU Financial. 1 Fitness and gymnastic classes for all ages, all abilities for males and females. All classes and local meetings are held at the Slovak Home in Farrell, PA; 800 Spearman Ave. (We have fully equipped modern gymnastic gymnasium, including a 42'x42' spring floor. 2 Financial Security through life insurance and investment opportunities. 3 Access to thousands of dollars in scholarships to qualified members; the Steve Banjak Memorial Scholarship for qualified Sokol Farrell members; the renewable Milan Getting Scholarship offered by Sokol USA; as well as others offered by GBU Financial. Click here to go to information on scholarships. 4 Participation in various social events throughout the year, such as our annual St. Nicholas Party, anniversary banquets, Slovak heritage events, etc. 5 Membership in a word-wide Sokol community; participation in Sokol events in the U.S and Canada, as well as in Europe, especially Slovakia and the Czech Republic. 6 Participation in our annual Sokol Farrell Golf Scramble on the second Saturday of June as well as in the National Sokol USA Bowling tournament. 7 Various sources of information; the national Sokol Times; the local Sokol USA Farrell Newsletter as well as Sokol websites, Facebook pages and the national GBU Reporter. Because Sokol USA is a fraternal organization, new members are nominated for membership at a monthly meeting by an active member of Sokol USA Farrell who knows the applicant personally and by doing so, attests to the good character of the applicant. For additional information, membership applications or to purchase insurance coverage, contact one of our officers, call us at 724.342.1129 and leave a message.